This Yangon tour in-depth allows you a chance to capture the quintessence of the most attractive city of Yangon and its surrounding. Be welcomed on a morning ferry to greet the light breeze and reach the beautiful Bago. Ultimately, feel tiny in front of the top world's most glistening pagoda and don't miss your opportunity to indulge in the vibrant Bogyoke Aungsan Market. The fascinating as well as the exciting experience of the depth Yangon is waiting for you to discover! Visit Chau Htat Kyi Pagoda where enshrine the giant reclining Buddha image with 65 meters high. Mingalabar! Welcome to Yangon! Picked up by our Myanmar tour guide at the airport and quickly transfer to the hotel for check-in. 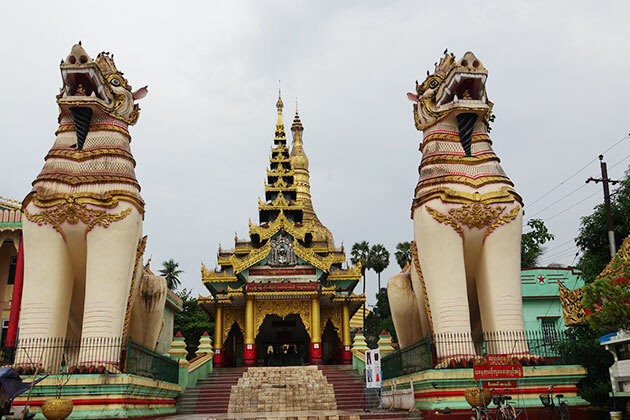 The rest of the day delivers you a chance to explore the hustle and bustle Yangon. At 1:00 pm, begin our private Yangon tour by passing through the beautiful street to witness the fabulous mix of architecture and sites. Next, stop at Chauk Htat Gyi Pagoda, the peaceful pagoda where enshrine the giant reclining Buddha image. Take a stroll to enjoy the tranquil atmosphere of the pagoda before moving to the Karaweik Hall – the huge floating golden barge emerging out of the water with the intricated design. Remember to bring your camera to save the best photos. Perhaps the most highlight of today is heading to the legend Shwedagon Pagoda. With 5448 diamonds and 2317 rubies tipped on the crown, the pagoda makes itself one of the most glistening pagoda around the world. Overnight in Yangon. Wake up early this morning and hit the road to the port to ready for a breathtaking ferry ride to reach Dala. Along the ride, enjoy the light wind swaying in the morning touches to your skin and see the traffic of Yangon on the riverside. Upon arrival, gaze out at people riding the trishaw and head to Orphanage – the local market to witness the daily lively trading of the community. In the afternoon, return to Yangon and get on the Circular Train. Constructed by the British in 1954, it covered with a railway track loop of 45.9 kilometers and stops at 39 stations. The drive requires you about 3 hours to take but it is really worth to pay to observe the magnificent spots. 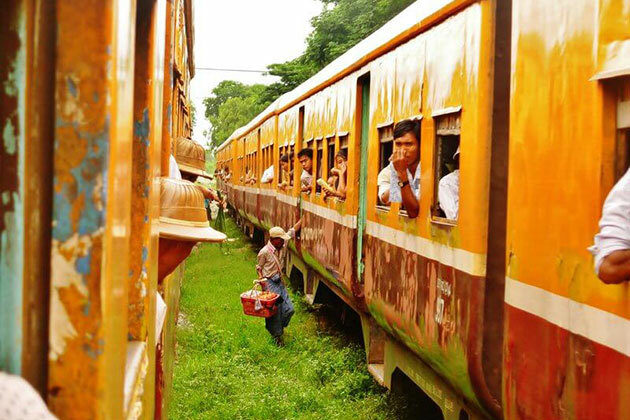 Along the route, capture the simple life of Burmese people beside the track. Go back to Yangon in the late afternoon. 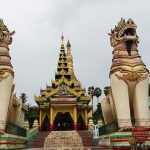 The morning of day 3 begins with a Yangon tour to Bago (also known as Pegu) – the poetic town where used to be the capital of the Mon kingdom. Spend the whole morning with your local guide to learn about history as well as the mythology of the region. Your next destination stop at the 55-meter long reclining Shwethalyaung Buddha in Shwethalyang Pyay, this is one of the largest images of Buddha that exists more than 1000 years old. 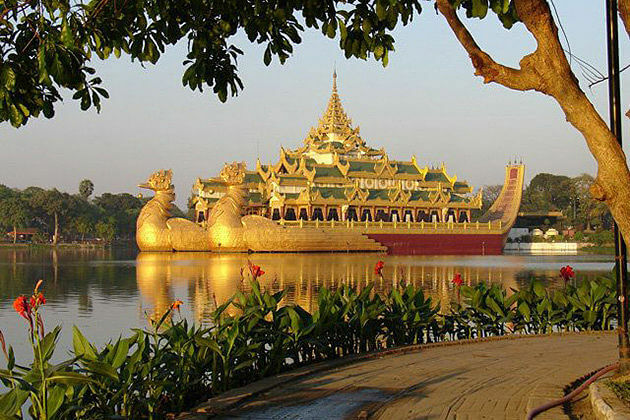 Afterward, head to Shwemawdaw Pagoda – the most outstanding relic of Bago. With 114 meters high, this pagoda is even higher than Shwedagon Pagoda in Yangon. Spend time to stroll along the city local sites with visits to the market and traditional village where produces the local woven. Lunch will be served at a local restaurant (with our own account) during the day’s touring in Bago. Your afternoon returns to Yangon city. Along the way, stop in in Htaukkyan township for a visit to the Allied War Cemetery. The scenic landscape and peaceful aura is the final rest of 27,000 Allied Soldiers in the Second World War will recall you to the painful history. Breakfast at the hotel and wait till the driver comes to pick you up to transfer to the airport where you Yangon tour ends. Hope we can serve you the next time in Myanmar. 3-night accommodation with breakfast at 3 stars hotels (With hotel option).